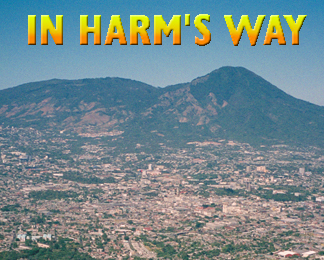 Approximately 2.7 million people in Central America live in the shadow of an active volcano. A new measure of that population risk could help save lives during a volcanic disaster. The community surrounding Mount Rainier in Washington is taking action to better prepare for giant mudflows that could sweep off the volcano, with or without advance warning. Geologists who once served in the Peace Corps reflect on the present state of the foreign volunteer program. A large climate model is borrowing computing time from more than 47,000 personal computers worldwide. 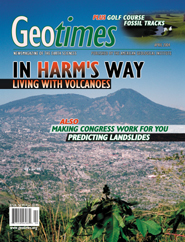 In its anniversary year, the U.S. Geological Survey continues to provide timely information to the public about the world's changing environment. Lobbying is a powerful tool for getting your message to Congress. Now more than ever, it is important that the United States be at the forefront of minerals research, and cooperative research centers could be the key. One by one, geology departments are fighting for their survival. Main photo: From the slopes Illopango Caldera looking north-northwest, Volcán San Salvador looms over the city of San Salvador, population 1.6 million. The main vent (Boqueron) is the rounded volcano in the middle of the skyline. The more conical-shaped peak to the right-middle of the skyline is El Picacho, a remnant of an older volcano. Photo by James Vallance, U.S. Geological Survey. See related stories on pages 14 and 18. Right top: At the Fossil Trace Golf Course near Denver, Colo., paleontologists discovered several well-preserved mammal tracks from the age of the dinosaurs. Photo courtesy of Fossil Trace Golf Course. See story on page 6.